What would it look like to engage in a deep sea adventure in the early 20th century? The Trade Literature Collection at the National Museum of American History Library includes catalogs illustrating diving apparatus and equipment from right around that era. 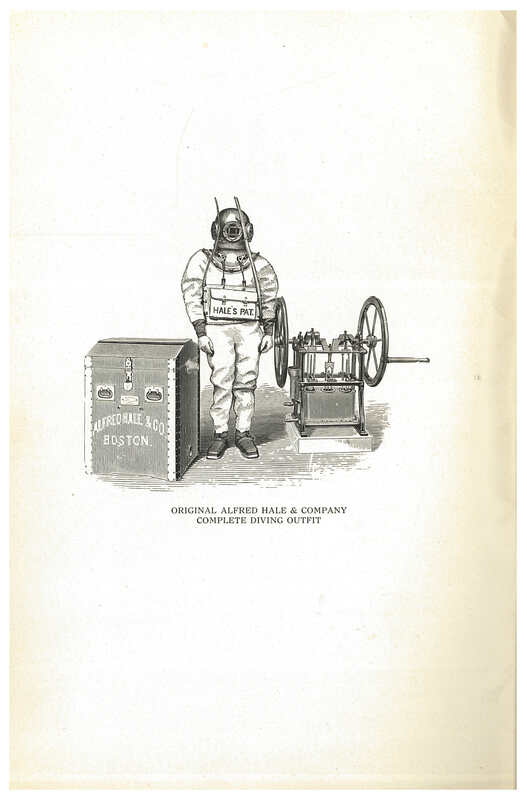 One of these companies is the Alfred Hale Rubber Co. which manufactured diving suits, equipment, and apparatus for divers doing all types of work. This might have included suits for shallow water, shell fishing, sponge fishing, mill work, sewerage, or tank work. By the time this catalog, Submarine Diving Dresses, was printed in 1917, Alfred Hale Rubber Co. had been in business for eighty years. The company was established in 1837. Alfred Hale Rubber Co., Boston, MA. 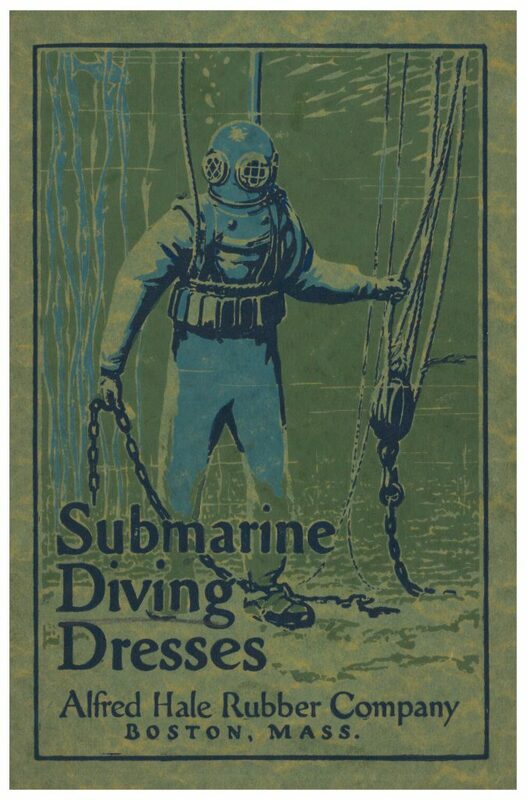 Submarine Diving Dresses, 1917, front cover of catalog showing a diver underwater. Alfred Hale Rubber Co., Boston, MA. Submarine Diving Dresses, 1917, title page of catalog. The diver shown below is equipped with the Original Alfred Hale & Company Complete Diving Outfit. Besides the diving suit, he is also wearing the helmet, shoes, and gloves. All of this equipment as well as other apparatus are briefly described in this 1917 trade catalog. Alfred Hale Rubber Co., Boston, MA. Submarine Diving Dresses, 1917, Original Alfred Hale & Company Complete Diving Outfit. One diving outfit manufactured by the company is illustrated below. 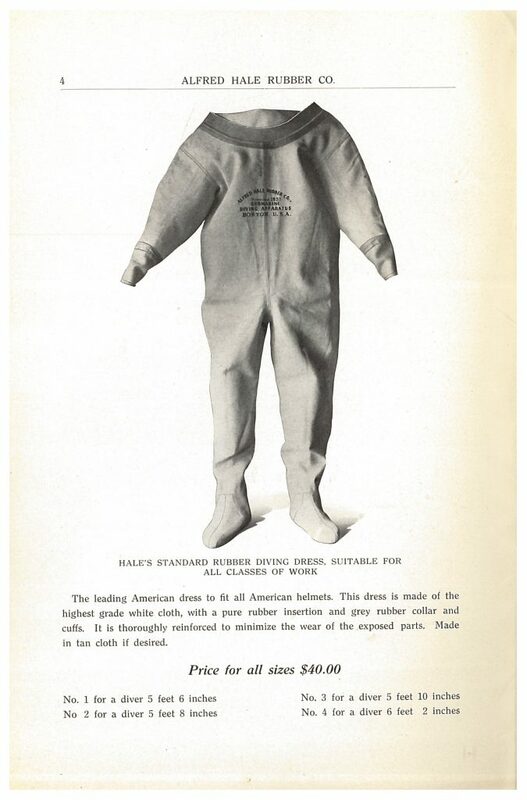 It is called Hale’s Standard Rubber Diving Dress. It came in either white or tan cloth with a grey rubber collar and cuffs. The outfit was available in several sizes based on the height of the diver. Alfred Hale Rubber Co., Boston, MA. Submarine Diving Dresses, 1917, page 4, Hale’s Standard Rubber Diving Dress. Besides the diving dress, divers also needed other equipment, some of which is pictured below. This included air hoses, rubber cuffs, helmets, shoes, and weights. The company manufactured both diving mittens and diving gloves with elastic wrists. Two fingered diving mittens were also available. Alfred Hale Rubber Co., Boston, MA. 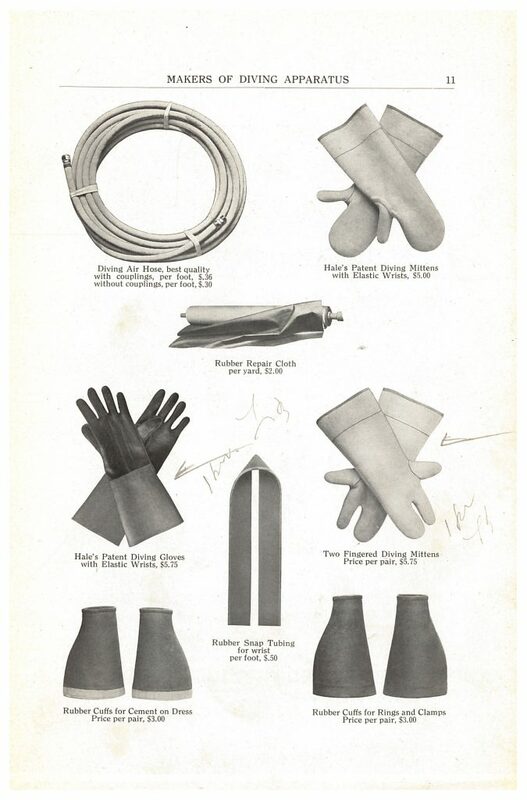 Submarine Diving Dresses, 1917, page 11, diving air hose, diving mittens, diving gloves, rubber repair cloth, rubber cuffs, and rubber snap tubing for wrist. 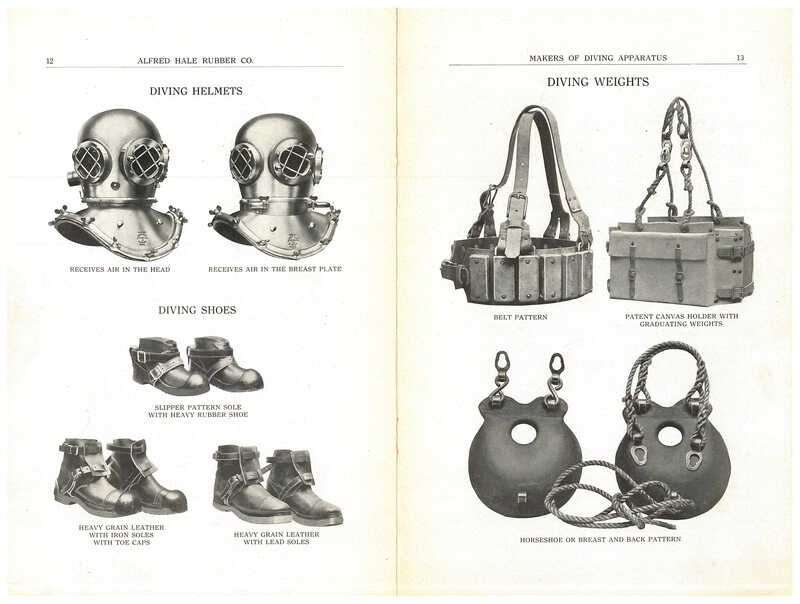 Two types of diving helmets are shown in this catalog. One received air in the head while the other received air in the breast plate. The soles of the diving shoes were made of different material, such as lead or iron, depending on the type of shoe needed. Alfred Hale Rubber Co., Boston, MA. Submarine Diving Dresses, 1917, pages 12-13, diving helmets, diving shoes, and diving weights. 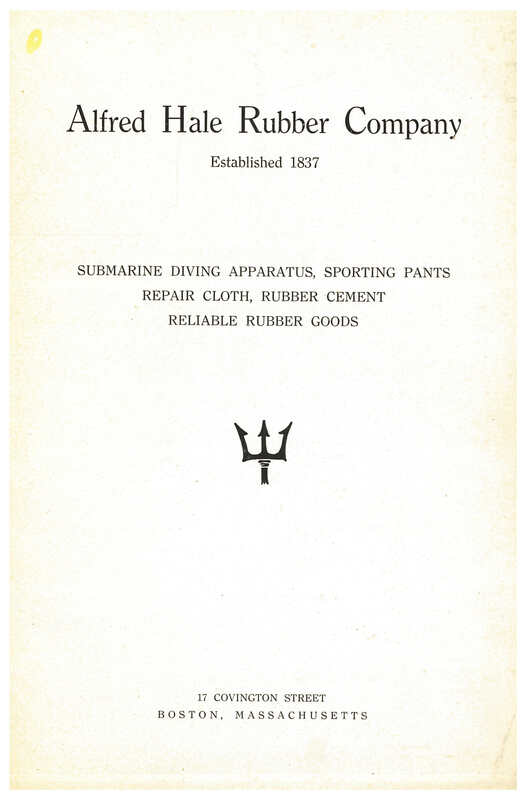 The catalog ends with detailed lists explaining which apparatus and accessories came with specific types of diving outfits. Submarine Diving Dresses by Alfred Hale Rubber Co. is located in the Trade Literature Collection at the National Museum of American History Library.